TMNT Entity: Fun at Bell County Comic Con! Fun at Bell County Comic Con! Had a great time at Bell County Comic Con this past weekend! 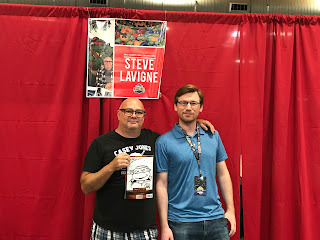 Spent most of it at the Ninjaink book, selling copies of our indie book Black Hops and other projects, but I DID get the chance to sneak away and meet Mirage TMNT comics legend Steve Lavigne! Great guy, did a sketch for me, and we talked about video games for a good while. That's one more Mirage dude I can mark off my list! Also got to meet Kevin Eastman and Ernie Reyes Jr. again; always a pleasure! With that out of the way, I'll try and get to those IDW TMNT comics left over from the past two weeks. I haven't forgotten!